The most lively memory I have of this stage of the Baltic tour is that I was close to damage the physical side of my spiritual guide. 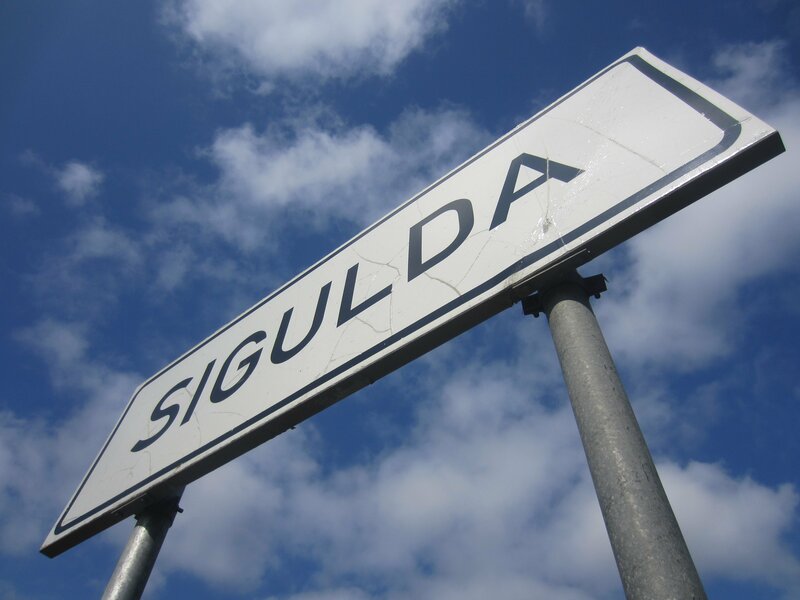 The first part was the most pleasant one: on a train to Valga, after leaving the beautiful Sigulda where we a guy working at the train station told us, is very good Italian “I was living in Italy for three years, close to Varese city. Dull place. Now I’m back here and I have a safe job for the railways company. I have a legal contract. There are many jobs available here in Latvia”. What can I say. In Valga we had breakfast, not before wasting a lot of time looking for a café. But Valga is a bar-less place so we ended up in a fast-food place in a mall instead. So what? Soon after we could enter in Estonia and the world there felt upside down. After a long cycling we stop in Torva (to read: ToRRva) to have lunch. We then proceed in the direction of Lõve (to read: Luuve) ready to take Facebook pictures at the village road signs. But, as a metaphor of life, we got lost looking for Lõve. In fact, we abandon the idea of looking for Lõve altogether and we took the fastest way to the destination. Like many people that settle down with whoever partner just for convenience. But I soon realized that the new road taken wasn’t the fastest. It was a big detour of many many kilometers. Once again, if you put Lõve as secondary, you’ll end up with real problems to face in life. Never the less, we made it to Murese farm even with few hours of delay. we were expecting the Italians to arrive, they started to cycle from Valga at 9.40am…should have arrived at 4pm the latest…but wind, Estonian “big mountains” and their romantic nature were not on their side. They went looking for a place called Lõve that they found is equal to the word Love and they got lost in their way looking for love. Of course they just explained it as adapting to Estonian slow nature, that they were so slow to arrive but finally they did tired and hungry at 7pm but still lucky enough to get a wonderful oven cooked lamb for dinner. Staying in the farm was lots of fun especially because, contrary to the other 10 volunteers, we didn’t have to work AND we got the best tends. We spent the (two) days cooking and running after some sheep, and the nights dry and warm while the rest of the gang was drowning under an heavy thunderstorm tempest that we didn’t even hear. The Bio-toilet with sunset view! Totally awesome.